With all the excitement over ornamental grasses, you might not even recognize this towering escapee growing in many of the city’s wet spaces as an invasive species. The picture above is of a huge stand of European common reed (Phragmites australis subsp. australis) near the entrance to the Leslie Street Spit. These stems are at least three metres (9+ feet) tall, and wave boldly in the breeze. Bold is right. For pig-headed invasiveness, this non-native grass has become a problem in the same league as garlic mustard (Alliaria petiolata), giant hogweed (Heracleum mantegazzianum), or my particular bugbear dog-strangling vine (Vincetoxicum rossicum). 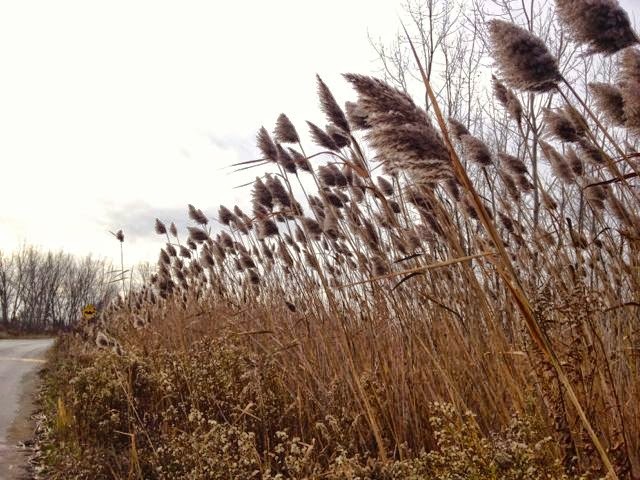 Complicating matters, there’s also a native Phragmites. 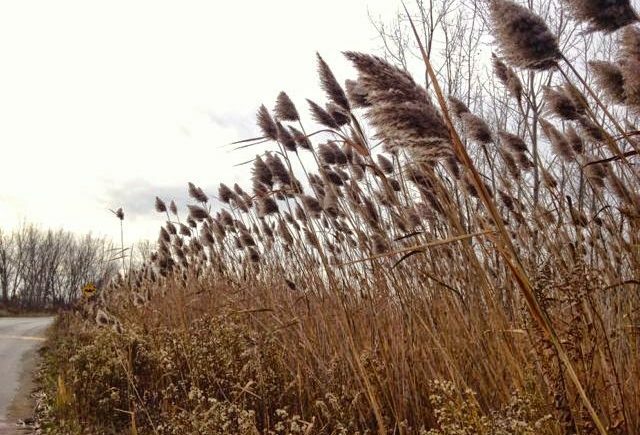 But, last March, the folks at the Toronto and Region Conservation Authority confirmed that all of the Phragmites on the Spit, which includes Tommy Tompson Park, was the non-native variety. Yes, all of it. Have you been to the Spit lately? At this time of year, the area around the ponds looks like an ocean of fluffy Phragmites seed heads. They seem to go on forever. This fact sheet from the Ontario Invasive Species Program helps you tell the difference between the native and non-native species. Generally, when the grass is this tall, it’s the alien. Let’s help by practicing citizen science. In Toronto, or anywhere in Ontario, help map the spread by contacting Stop the Invasion. Visit that site for scary details and ways we can do something about it. A common saying goes "Be careful what you wish for"…. I just say be careful what you plant! It's scary how much destruction a harmless looking plant can create planted in the wrong habitat. We humans think we know it all but Mother Nature ALWAYS knows better. You just can't go wrong growing natives. Thanks for sharing this informative (& scary) post! I was surprised at how total the invasion was on the Spit. All those wet spaces, choked with the wrong roots. We have the invasive Pampas grass and Arundo donax here to plague us. Good luck with the invasion. Yep, Phragmites is an alien baddie, right up there with Common Buckthorn and Tree of Heaven. Too bad about its dominance at the Spit, I imagine it greatly reduces the biodiversity by creating this monoculture.